Dozens of pipers from around the world have made their way through Glasgow as the city prepares to host the 2013 World Pipe Band Championships. Four bands competing at the event - known as The Worlds - Beat the Retreat from St Enoch Square at 12:00. They marched along Argyle Street and Queen Street before arriving and performing in George Square. 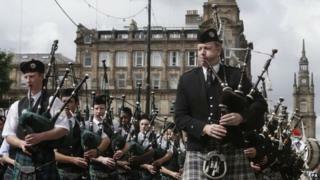 The Worlds will see some 225 bands with 8,000 pipers and drummers compete at Glasgow Green on Saturday and Sunday. Bands from 17 different countries are taking part in the event, which is being staged over two days for the first time. The Worlds will also mark the climax of the The Glasgow International Piping Festival - known as Piping Live - which is now in its 10th year. Ian Embelton, chief executive of the Royal Scottish Pipe Band Association said: "Every year we try and make The Worlds bigger and better and changing to two days is a reflection of just how popular it has become. "The bands have responded magnificently with 225 entries from 17 countries so visitors will enjoy hundreds of performances each day and a whole host of other entertainment as Glasgow Green is transformed into a celebration of Scottish culture." Field Marshal Montgomery Pipe Band from Belfast won the previous two championships. They will be going up against bands from Scotland, England, Canada, Norway, Brazil and Mexico as they bid to retain the title. The World Pipe Band Championships is organised by Glasgow Life on behalf of The Royal Scottish Pipe Band Association and Glasgow City Council. Cllr Archie Graham, chair of Glasgow Life and chieftain of this year's Worlds, said: "The event has grown into a cornerstone of the city's cultural calendar which attracts people to Scotland from all over the world. "Being asked to be chieftain is a real honour and I can't wait to soak up the unique atmosphere of this huge celebration of Scottish culture."